We are in the beginning of beautiful seasonal change to autumn. The air has dried out except for the occasional typhoon that rolls in from the pacific. I can still get away with wearing a short sleeved shirt during the day, but last night I had to pull on a light jacket. I love it. Autumn and spring are my two favorite times of year. The light becomes incredible as the days grow shorter and shorter after the equinox. 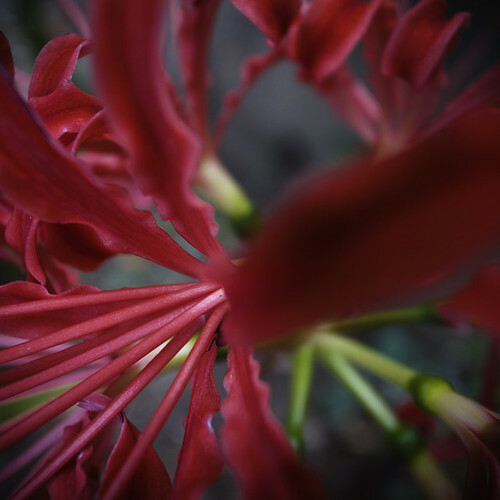 I had never noticed the Red Lily Spider flower until after the March 11th disasters, when I my soul searched out nature where ever I could find it. My eye were beginning to sync with the seasons when I first spotted these popping out of the ground in a little temple garden in Ichikawa, Chiba, Japan. I called them spiders, because honestly that is what they looked like only they were a stunningly hue of red. 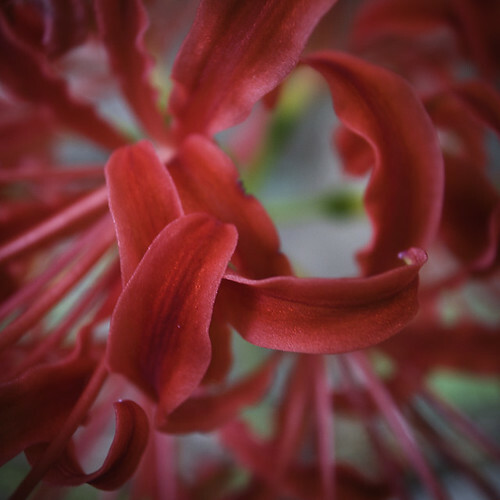 The are called Higanbana or Manjushage in Japanese meaning “never to meet again, lost memory, abandonment” which is quite fitting because the bulbs are highly poisonous. Autumn is here because the moon and the higanabana have told me so. May you all have a peaceful day of rest, and enjoy the changing seasons. 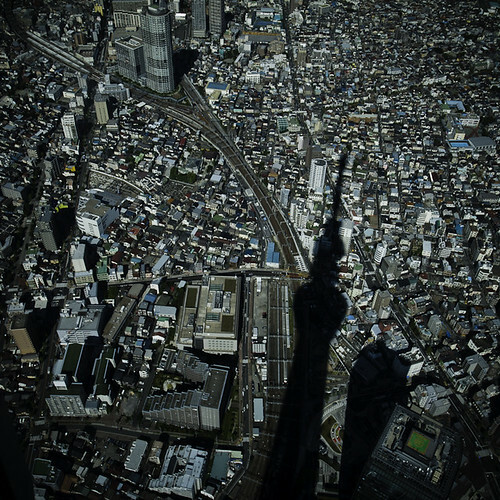 Tokyo is seemingly endless. I am still finding places that I have never been. 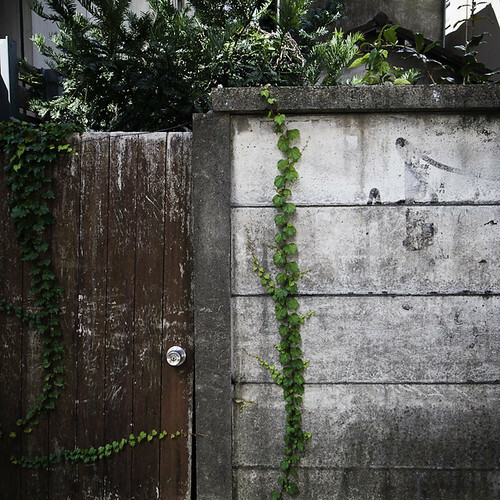 Today’s wander was around Uehara to Yoyogi. Never getting that lost, but just lost enough to just on what I see around me. When I am on a wander my senses are on high alert, scanning over the streets, and turns. Looking for whatever catches my soul. 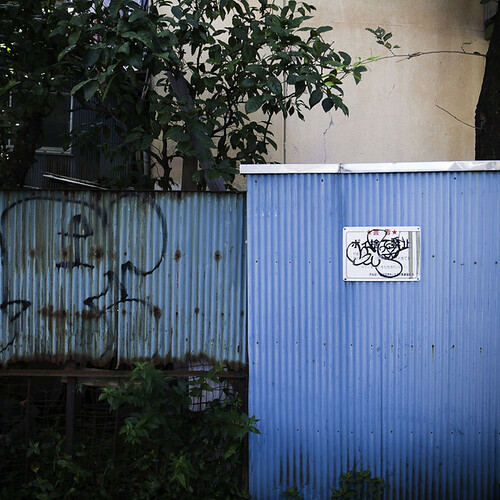 A perfectly aligned garden on an edge, a backdoor to an old Showa era home, an outer wall constructed out of that famously blue hued corrugated metal. Its all good for my soul. Get lost, get found, and a long the way keep on snapping. I was in good graces to be invited out to catch the two most legendary “H” performers in Japan. 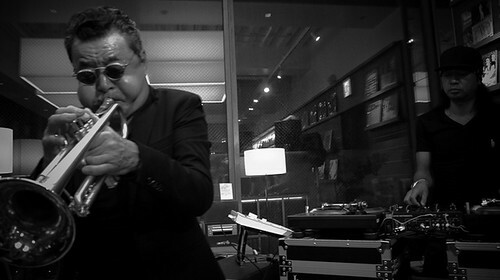 The jazz trailblazer Terumasa Hino, and the world renown hip hop dj honda. 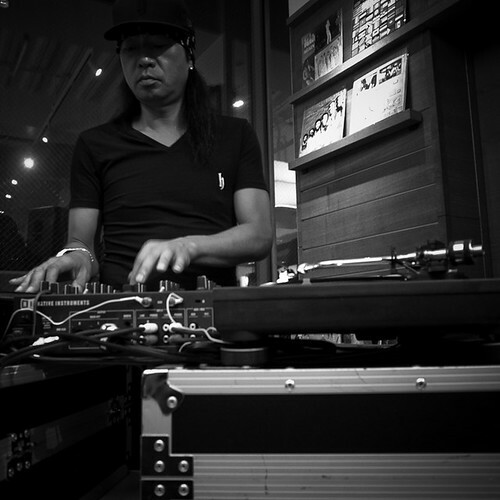 Dj Honda has been putting out beats and working with an international cadre of performers since the early 90s. 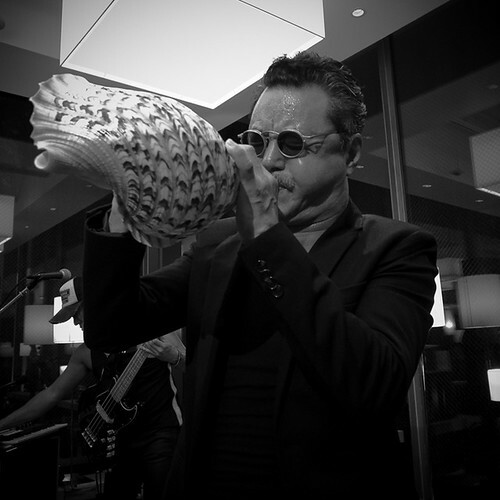 Terumasa’s has been blowing the horn since the 60s. In the wake of the 311 triple disaster the two teamed up along with Hino’s son Jino on bass to form h-factor. The sound is where urban cuts meet the smooth and free flowing blasts of Hino’s trumpet. They are on a tour to promote the new album Unity which can be downloaded from itunes. I was fulljoyed that Hino pulled out a shell horn to blow on for my favorite Okinawian flavored track Funakura. They only played a short 40 minute set of three songs the other two were also off the album including the title track Unity and Never Forget 311, commemorating the triple disasters of March 11, 2011. After the show I asked dj honda what was up next for him. He told me that for him it is everyday in the studio making beats and a tour in Japan. Later in the year he will make a trip to the US. It was a great night out with great music, and good peeps! Tokyo Gets the 2020 Olympics, Now What? It was made official at 5 o’clock in the morning Tokyo time that Tokyo will host the 2020 Summer Olympics. This should be good news, right? I have such mixed feelings about it. First lets look at the good points. Japan has been besieged with disasters for the past several years. I have personally lived though them and rode the waves of depression, fear and anger that followed those seismic waves. At this point in time Japan and the city of Tokyo have been given a piece of optimistism about the future. Of course there will be loads of money made off the olympics, but the real question is will that revenue filter down to the everyday man and woman, myself included. That historically is usually not the case. The big corporate sponsors will make off like Madoff, while the mom and pop shops shutter up. Now lets take a look at what is Japan actually facing. Japan is still being criticized the world over for it’s mishandling of the Fukushima triple disaster. Japan and its citizens need to face up to the facts and do what is necessary to correct Fukushima, and to take effective measures for it to never happen again. Japan has totally bungled it’s economy and has a debt that is growing larger second by second. I am no economist, but I feel the bite of rising food prices while salaries remain completely stagnant. These are all very serious problems that need answers. I am optimistic about the future, because to be pessimistic pushes me over the edge of depression. I do truly hope for the best. I hope that the Olympics will not be used as a snake medicine cure all tonic, that will only lead to ruin and disappointment. 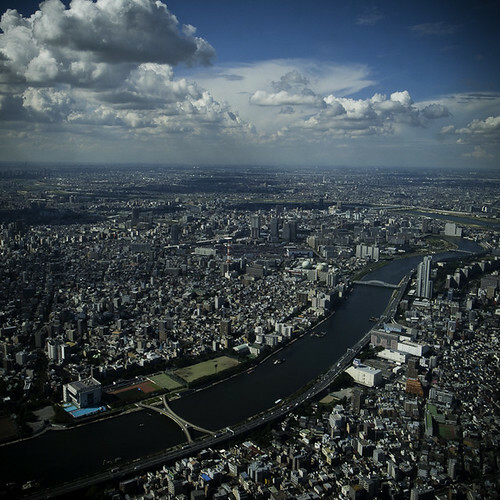 Tokyo and Japan at large has set itself a goal of the year 2020. There is a lot of hard work to be done to show the world what a great country Japan can be. I have to be hopeful that bread and circuses tactics of the past will be discarded for a brighter future. 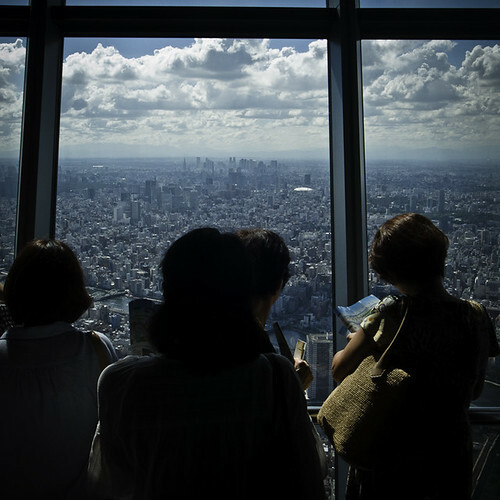 Finally decided it was time to venture to the top of Tokyo’s latest Babel attraction, Skytree. It has two observation decks. One is at 350 meters and the other at 450 meters. All I could think about was how the sprawl seemed endless. Only stopping when it hit Tokyo Bay, or the mountains. In 360 degrees there was concrete lego blocks as if them had been dropped and stacked by the jolly green giant himself. Then there was the sky. The sky was boundless. There weren’t any boundaries until the stratosphere melds into space. The sky dwarfed all that man has built below. I don’t know if we should build so high. The view was amazing, and seeing my tiny part of Tokyo as only a little bump near the bay helps to put things back into their proper view. We don’t have enough time on this planet to let our precious time waste on hate and pain. Focus on the good. See the light that we have been provided with. Look at each other with warmth in our hearts. Don’t let fear shape our hearts into hate. 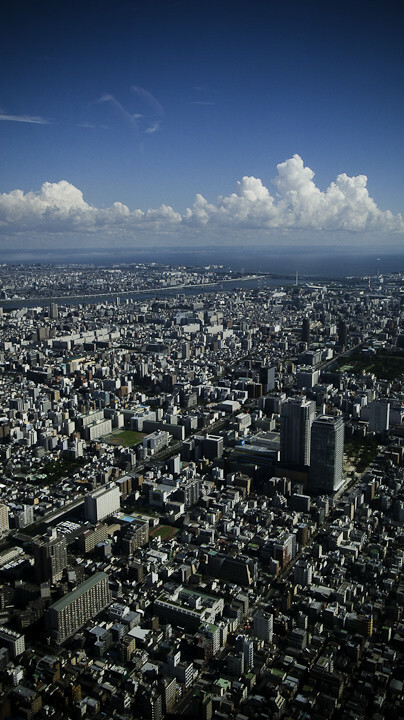 All of this from atop the new Tower of Babel, Skytree. Over 500 pictures taken in the land of Korea, why is it that I have chosen to post and write about this one first? That is truly an intriguing question. Perhaps it is because this image is unlike everything else I had taken in Seoul. I focused so much on the urban landscape. 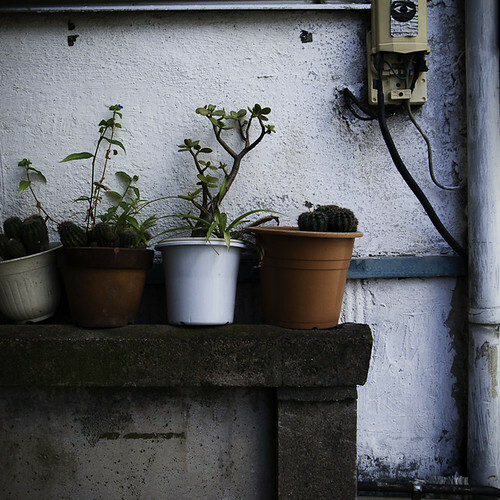 I wanted to come to an understanding of how the location of where the Korean people live. I wanted to see their homes, gardens, and gates. 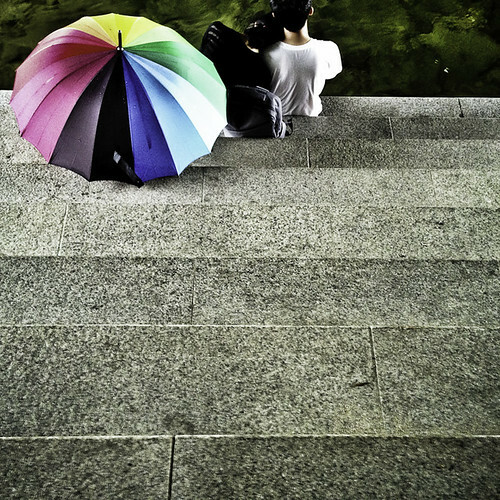 This image of two lovers is not about where people live, it is about where they escape. The two lovers in the image had kicked their shoes off and catching a bit of private time on a hot and steamy Sunday afternoon. My friend had pretty much insisted that I visit Seoul’s Cheonggye Plaza, even though on paper it really didn’t grab my interest. I was wrong. It was a beautiful cooling off spot that runs though the heart of Seoul. Children played in the shallow stream. Old men poured each other cups of makori rice beer. It was a place to melt away and just relax. I was stealing away there too. A chance to duck under one of the many overpasses, and let the cool breeze wick around my sun baked skin. Catching a glimpse of two lover, surrounded by many, but alone with each other. 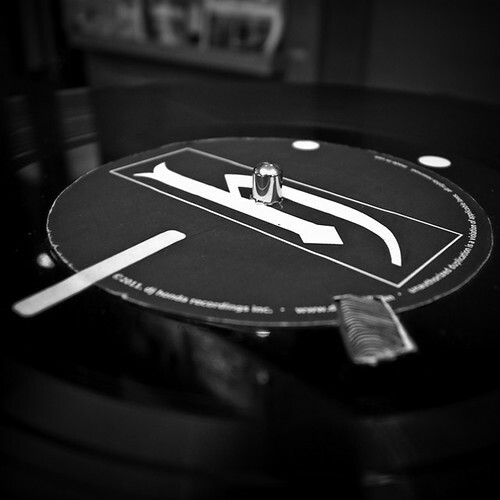 You are experiencing the archives for September, 2013.